The circuit produces energy to change the points and ceases to provide any more current. This is carried out by the switching arrangement within the circuit, by sampling the output voltage. This circuit will operate a two-solenoid point-motor and prevent it overheating and causing any damage. Note: If you want to control the points with a DPDT toggle switch or slide switch, you will need two CDU2 units. The point-motor can be operated via a Double-Pole Double-Throw Centre-Off toggle switch, providing the switch is returned to the centre position after a few seconds so that the CDU unit can charge-up. 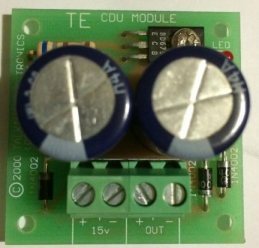 he circuit is supplied by 16v AC or DC and the diode on the input is used to rectify the voltage if AC is supplied. If nothing is connected to the output, the base of the BD679 is pulled high and the emitter follows. This is called an emitter-follower stage. The two 1,000u electrolytics charge and the indicator LED turns on. The circuit is now ready. When the Main or Siding switch is pressed, the energy from the electrolytics is passed to the point motor and the points change. As the output voltage drops, the emitter-follower transistor is turned off and when the switch is released, the electrolytics start to charge again.